Preheat oven to 325 degrees F. Line an 8x8 glass baking dish with parchment paper and spray with coconut oil spray. Add cookies to a food processor and pulse to break down. Then add ghee and pulse to combined until a crumbly mixture is created. Place crumbled mixture in the baking dish and press down until evenly throughout the entire dish. Add softened cream cheese to a bowl and use a hand mixer to beat the cream cheese until smooth. Then add sugar, pumpkin puree, vanilla extract, pumpkin pie spice and beat for 1 minute. Lastly, add each egg one at a time, scraping down the sides and beating for one last minute. Pour cheesecake mixture over crust and smooth throughout. Place in oven to bake for 45 minutes until the edges have slightly browned and middle of cheesecake is only slightly jiggly. Then turn off the oven, crack the oven door open, and let the cheesecake rest for 1 hour in the oven. After an hour, remove cheesecake from oven and let cool completely. 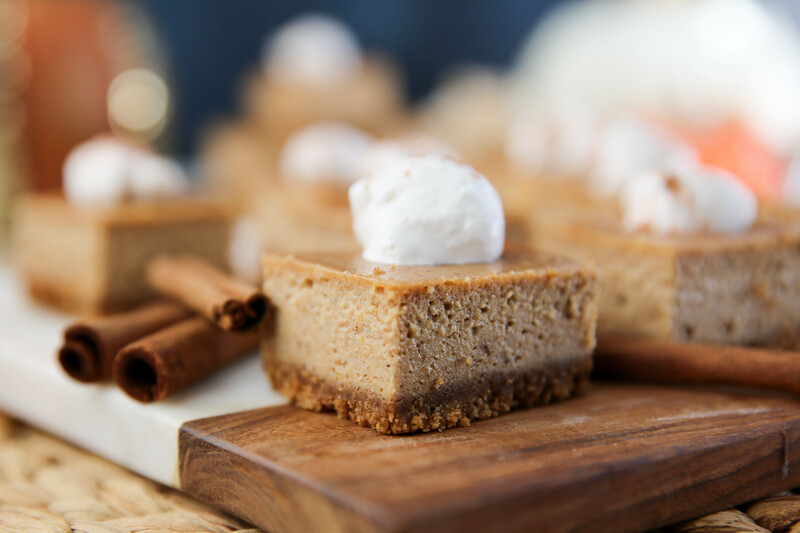 Then cover and place in the fridge overnight before slicing into 16 bars and topping with coconut whipped cream and a dusting of cinnamon before serving!